"Henceforth, you shall be known as - Darth Vader..."
The final Star Wars movie is coming to DVD. Episode III is truly a great ride and most likely the best of the prequel movies. Revenge of the Sith shows just how Anakin Skywalker is seduced by the Dark Side of the Force and becomes Darth Vader. 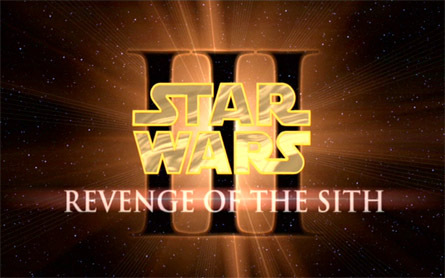 Disc One of the Revenge of the Sith DVD set opens with one of three random themes: Mustafar, Utapau and Coruscant. 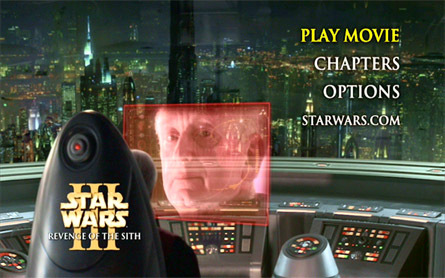 Besides the look, the three themes are basically the same with all the same menu options: Play Movie, Chapters (there are 50 of them), Options and Starwars.com (for online content using your computer). In case you are wondering, unlike the Episode I and II DVDs, the version of Episode III on DVD appears to be the same as the theatrical version. 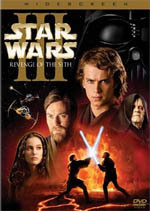 Oddly, the cover of the DVD seems to differ from the original theatrical poster: Anakin's scar above and below his eye is gone. The film is presented in 2.35:1 anamorphic widescreen and the detail is astounding. This is a perfect video transfer from the original digital source. The options menu is something you will want to check out. 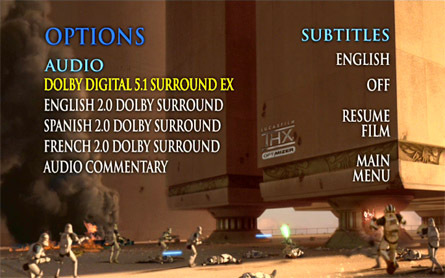 Besides the usual English subtitles, a THX optimizer (to tweak your TV and audio system), there are also several audio options to choose from: Dolby Digital 5.1 EX, English Dolby Digital 2.0, Spanish Dolby Digital 2.0, Spanish Dolby Digital 2.0, French Dolby Digital 2.0, and an Audio Commentary track by George Lucas, Rick McCallum, Rob Coleman, John Knoll and Roger Guyett. The 5.1 EX soundtrack is amazing. You will also find a nifty little Easter Egg on the Options menu by pressing the (+10) button on your remote, then (1) then (1), wait for the pause, then press (3), wait for the pause and then finally press (8). You will be treated to a special Yoda rap and the DVD credits. Unlike the Episode I and II DVDs, there is no blooper reel. All of the other extra features are located on Disc Two. First up is ‘Documentary and Featurettes’. There are three features to look at in this section which are presented in widescreen with Dolby Digital 2.0 audio. First is “It’s All For Real: The Stunts of Episode III” which runs 11 minutes and shows a behind the scenes look at the stunts of Episode III. Next is “Within A Minute: The Making of Episode III” which runs 1 hour 17 minutes and looks at a single scene (of Mustafar) that was less than a minute of screen time and goes through every department that worked on that one scene. The best feature is last with “The Chosen One” which runs 14 minutes. If you ever wondered what the complete 6 movie story was all about, George Lucas does a pretty good job laying it out for you. This featurette also shows how the animation department has already done the work to replace the Yoda puppet in Episode I with an animated version. Looks real good. The ‘Deleted Scenes’ section on the disc holds a few real gems. There are a total of 6 deleted scenes presented in widescreen with Dolby Digital 5.1 sound. Each of the scenes also have an opening introduction by George Lucas and/or Rick McCallum. You can choose to “Play All With Intros”, “Play Scene With Intro”, “Play All Scenes” and “Play Scene”. 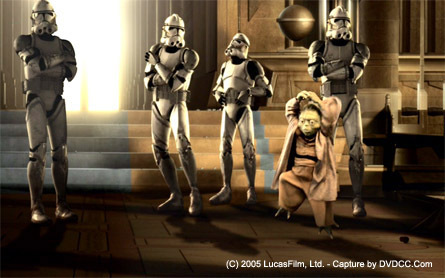 First deleted sequence is “Grievous Slaughters A Jedi: Escape From the General (Animatic)” which runs 2 minutes and 50 seconds. This clip shows Jedi Shaak Ti being killed by Grievous. Oddly, this deleted scene was not totally completed for the DVD release. Next is “A Stirring In the Senate (Bail’s Office)” which runs 1 minute and 52 seconds. This and the next 2 deleted scenes have to do with the birth of the Rebellion. 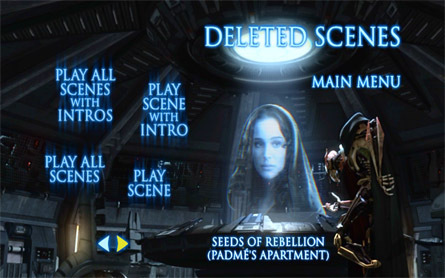 “Seeds of Rebellion (Padme’s Apartment)” runs 1 minute and “Confronting the Chancellor (Palpatine’s Office)” runs 2 minutes 8 seconds. Some of the Rebellion footage might should have remained in the film. It works really well. “A Plot to Destroy the Jedi?” runs 1 minute and basically is Yoda, Obi-Wan and Mace talking about Palpatine. Lastly is “Exiled to Dagobah” which runs a very short 39 seconds. The clip shows Yoda landing an escape pod on his new home. If you watch all 6 Star Wars movies in order like George Lucas wants you to, then it really is better that this Yoda sequence got cut. It leaves a little bit of mystery about “what happened to Yoda?” until Episode V. Great sequence though. The ‘Trailers and TV Spots’ section contains various theatrical and TV commercials. The tree trailers (“Nostalgia” running 1 minute 40 seconds, “Epic” running 2 minutes 27 seconds, and “A Hero Falls” music video running 3 minutes 40 seconds) are all presented in widescreen with Dolby Digital 2.0 audio. 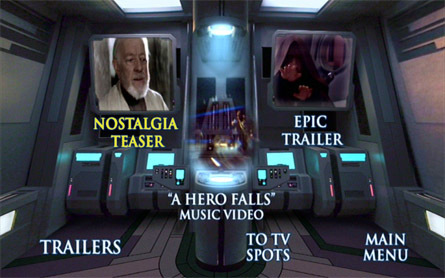 There are also 15 different TV spots for your viewing pleasure: “Jedi Action (Kids)”, “Jedi Unite”, “Showdown”, “To Protect You”, “Seduction”, “Celebration”, “Brothers”, “Epic Tragedy”, “Teaser Cutdown”, “Trailer Cutdown”, “Dark Side Unleashed”, “Tragedy”, “Sith Happens”, “Jedi Action” and “Review”. 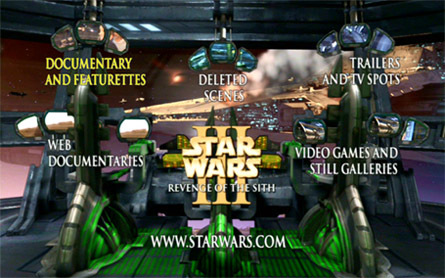 The ‘Web Documentaries’ section on the disc allows you to access the 15 different web docs that were available on starwars.com. ‘Video Games and Still Galleries’ contains some cross-promotional stuff from their video game department. 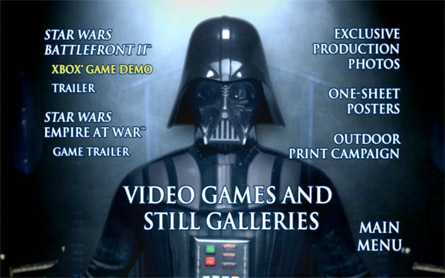 First there is an X-Box playable demo of LucasArt’s new “Star Wars: Battlefront II” video game. There is also a 2 minute trailer for the game presented in full screen with Dolby Digital 2.0 audio. Next is a 2 minute 11 second trailer for a new game called “Empire at War” as well. There is also a 150 picture “Exclusive Production Photos” gallery to flip through, a 20 poster “One-Sheet Posters” section and a 7 image “Outdoor Print Campaign” section. Lastly, there is a starwars.com link for those of you that have a DVD-Rom inside their computer with internet access. In conclusion, all 6 Star Wars movies are now available on DVD for you to enjoy. I highly encourage everyone to have all the films in their collection. Feel the Force all the way through! This is a DVD you HAVE to experience.